An OKCash wallet is as simple as a single pairing of an OKCash address with its corresponding OKCash private key. Such a wallet has been generated for you in your web browser and is displayed above. To safeguard this wallet you must print or otherwise record the OKCash address and private key. It is important to make a backup copy of the private key and store it in a safe location. This site does not have knowledge of your private key. If you are familiar with PGP you can download this all-in-one HTML page and check that you have an authentic version from the author of this site by matching the SHA1 hash of this HTML with the SHA1 hash available in the signed version history document linked on the footer of this site. If you leave/refresh the site or press the "Generate New Address" button then a new private key will be generated and the previously displayed private key will not be retrievable. Your OKCash private key should be kept a secret. Whomever you share the private key with has access to spend all the bitcoins associated with that address. If you print your wallet then store it in a zip lock bag to keep it safe from water. Treat a paper wallet like cash. Add funds to this wallet by instructing others to send OK coins to your OKCash address. Check your balance by going to to http://paperwallets.okcash.co and entering your OKCash address. Spend your OKCash by downloading one of the popular OKCash p2p clients and importing your private key to the p2p client wallet. Keep in mind when you import your single key to a OKCash p2p client and spend funds your key will be bundled with other private keys in the p2p client wallet. When you perform a transaction your change will be sent to another OKCash address within the p2p client wallet. You must then backup the p2p client wallet and keep it safe as your remaining OKCash will be stored there. Satoshi advised that one should never delete a wallet. Why should I use a Bulk Wallet to accept OKCash on my website? The traditional approach to accepting OKCash on your website requires that you install the official OKCash client daemon ("okcashd"). Many website hosting packages don't support installing the OKCash daemon. Also, running the OKCash daemon on your web server means your private keys are hosted on the server and could get stolen if your web server is hacked. When using a Bulk Wallet you can upload only the bitcoin addresses and not the private keys to your web server. Then you don't have to worry about your OKCash wallet being stolen if your web server is hacked. How do I use a Bulk Wallet to accept OKCash on my website? Use the Bulk Wallet tab to pre-generate a large number of OKCash addresses (10,000+). Copy and paste the generated comma separated values (CSV) list to a secure text file on your computer. Backup the file you just created to a secure location. Provide an option on your website's shopping cart for your customer to pay in OKCash. When the customer chooses to pay in OKCash you will then display one of the addresses from your database to the customer as his "payment address" and save it with his shopping cart order. You now need to be notified when the payment arrives. Google "OKCash payment notification" and subscribe to at least one OKCash payment notification service. There are various services that will notify you via Web Services, API, SMS, Email, etc. Once you receive this notification, which could be programmatically automated, you can process the customer's order. To manually check if a payment has arrived you can use a Block Explorer. Replace THEADDRESSGOESHERE with the bitcoin address you are checking. It could take between 10 minutes to one hour for the transaction to be confirmed. OKCash will safely pile up on the block chain. Use the original wallet file you generated in step 1 to spend them. Warning: Choosing a strong passphrase is important to avoid brute force attempts to guess your passphrase and steal your OKCash. Your OKCash Private Key is a unique secret number that only you know. It can be encoded in a number of different formats. Below we show the OKCash Address and Public Key that corresponds to your Private Key as well as your Private Key in the most popular encoding formats (WIF, WIFC, HEX, B64, MINI). 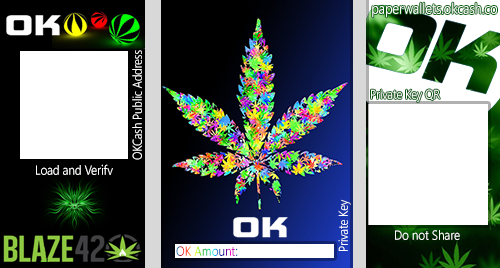 OKCash v0.6+ stores public keys in compressed format. The client now also supports import and export of private keys with importprivkey/dumpprivkey. The format of the exported private key is determined by whether the address was generated in an old or new wallet. An important part of creating a OKCash wallet is ensuring the random numbers used to create the wallet are truly random. Physical randomness is better than computer generated pseudo-randomness. The easiest way to generate physical randomness is with dice. To create a OKCash private key you only need one six sided die which you roll 99 times. Stopping each time to record the value of the die. When recording the values follow these rules: 1=1, 2=2, 3=3, 4=4, 5=5, 6=0. By doing this you are recording the big random number, your private key, in B6 or base 6 format. You can then enter the 99 character base 6 private key into the text field above and click View Details. You will then see the OKCash address associated with your private key. You should also make note of your private key in WIF format since it is more widely used.